Down in the Depths... Did the Octopus capture her? Rescue her? OOH - I Did enjoy making this immensely! 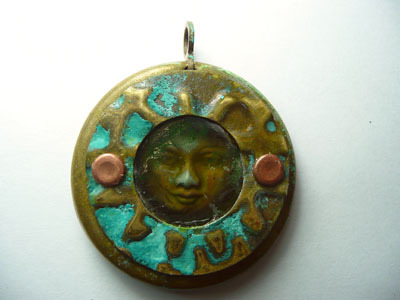 From a brass curtain ring, a blank disc and a round open blank- a porthole is created! 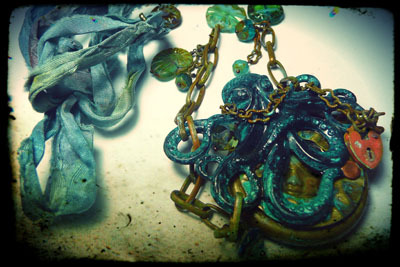 Firstly patina all components that require it (as per instructions in Chain Tutorial). 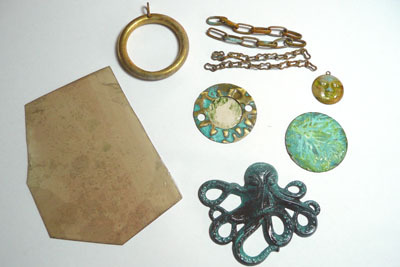 So having verdigris-ed the moon, open drilled round blanks, base 32mm disc blank, chain , curtain ring and Oooky (octopus) and sealed them all we are ready to proceed. You can emboss the blanks with your Cuttlebug or Sizzix machine, there are some cool Deco Emboss Vintaj dies on the B'sue Boutiques website that work nicely with their lightweight blanks. Attach the mica to the back of one of the double drilled blanks and glue into place. Once dry sandwich the mica between the two double driled blanks and glue (or rivet ) together back to back. You could just use one drilled blank but I wanted it neat even though you can't see the inside! 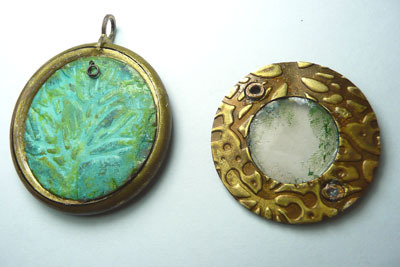 Add some "algae" to the mica (green acrylic paint dabs with finger). Allow all glue to dry. Then glue top "porthole" section to the front of the curtain ring. 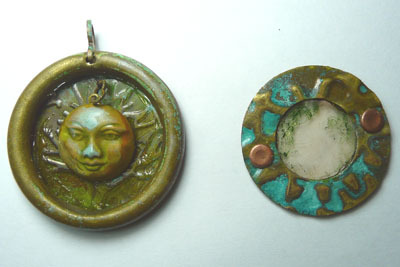 Even alone this looks an effective way to create a versatile setting similar to a pocket watch case. I am sure I will be revisiting this technique many times with lots of variations on a theme. You COULD use resin instead of mica but the back would need to be very sealed OR cover back of curtain ring in tape and remove after resin has cured. Also the face wouldn't have any movement as would be set in the resin filling. I like the mica as it has bubbles and looks old. 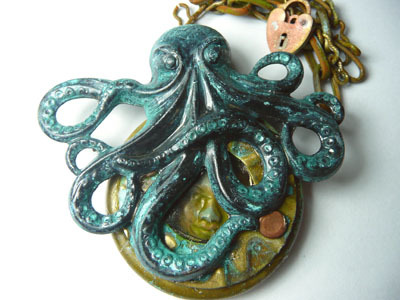 Glue Oooky octopus strategically onto the front - try not to hide too much of the moon face. 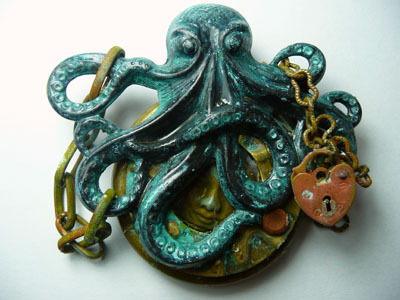 I positioned him so necklace would be asymmetric. 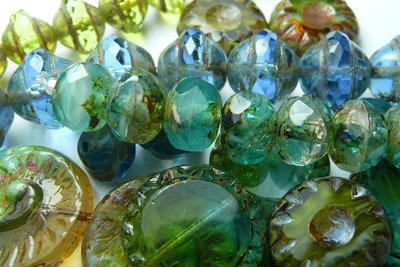 Select some glass czech picasso beads to match your theme . 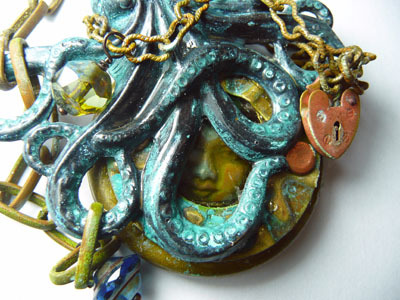 I LOVE picasso finish beads-they really do look aged as if they have been to the bottom of the sea. Now add your chains, as much or as little as you please. Fasten loosely in place with a chain link and add the padlock. Add as many drops and dangles as you wish - simple beads on headpins are effective. 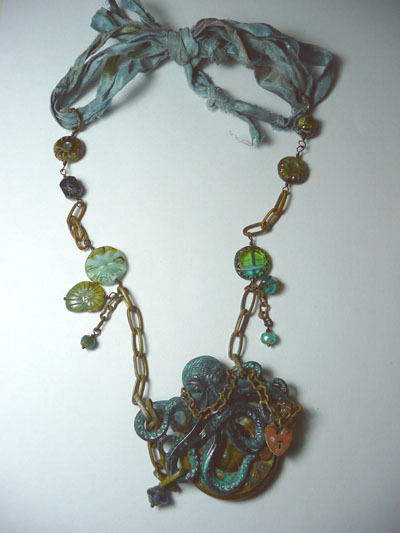 I used sari ribbon looped through either necklace end to make a simple knotted fastener. Did she just wink ?